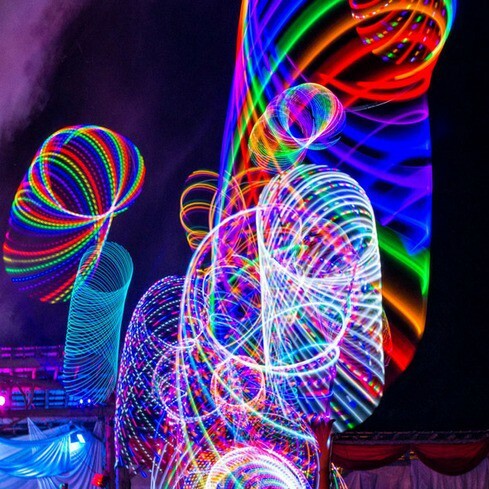 Chaotic Toss is a single hoop workshop focusing on Unconventional Tosses that can emerge from plain-less, 3D hoop techniques. We’ll start the workshop by connecting to the three dimensional frame work for the tosses: coin flip, helicopter, folding and well as warrior grip. Focusing on the different points of rotation each technique creates, we will follow through the different release positions, energy direction and speed needed to create a toss that gives enough order to the hoops flight. In this process we are all the while training the eye to see the differences in the release and the possibilities of contact for the catching hand. After running through the techniques with a static core position, we will explore how movement of the body changes the effect on the hoop. Movement gives way to expansion within the ability to stall or seemingly float the hoop or meet the hoop more quickly if we choose. Workshop will finish up questions, answers or ideas on how to incorporate Chaotic Toss into your current Flowbilities. Previous postThe Perfect Mother’s Day Present!! Next postWhat is a Hoop Dojo?